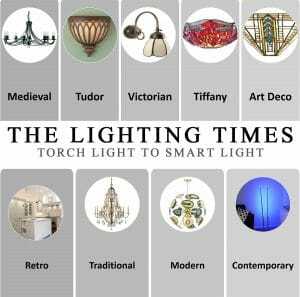 Home »LIGHTING BY ERA»The Lighting Times; From Torch-Light to Smart Light! 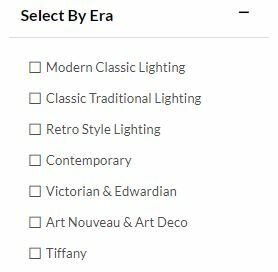 Here at The Lighting Company, we understand that deciding which lights are best for you to buy can be a little daunting. There are many things that you can do to help narrow down your search and one of them is the era from which they are inspired, to help it fit in seamlessly with your architecture and furniture. Lighting is an essential part of modern day life that we all appreciate and is a valuable way to authenticate a design that we are striving for in our homes. Lights have been around for hundreds of years in their various guises, so taking a trip down memory lane, we can show you a number of lights suitable for period homes and sentimental settings up to the present day. This era ran from around 800 until 1500 and was therefore inspired by flaming torches and candles with heavy wood and wrought iron functional designs, showing rivets and soldering details from the handmade process. Keeping the iconic metalwork is key to the design and many offer subtle ornamentation that would have been common amongst the very wealthy during the times. This style of lighting is perfect to compliment rustic renovation projects, with the askew character and charm from the era. Perfect in barn conversions and sympathetic chapel and church transmogrification, this look is great to capture some regal charm against a backdrop of wooden beams and high ceilings. 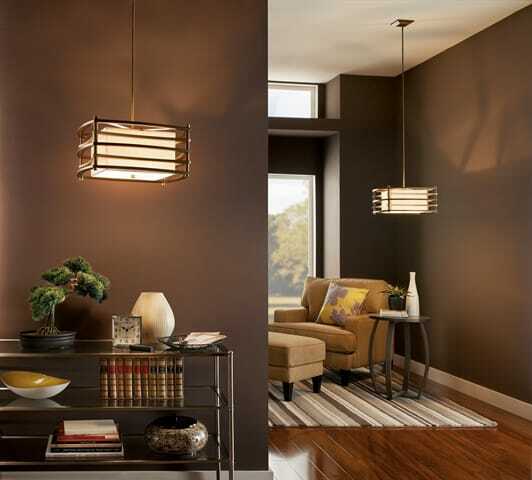 The use of candle bulbs and candle effect shades adds another element of authenticity to the design. The Kyle range of lights feature a dark bronze metalwork, teamed with a butterscotch onyx shade which offers the look of a glowing candle. The Maypole range of lights is another excellent range to introduce Medieval glamour to your room. 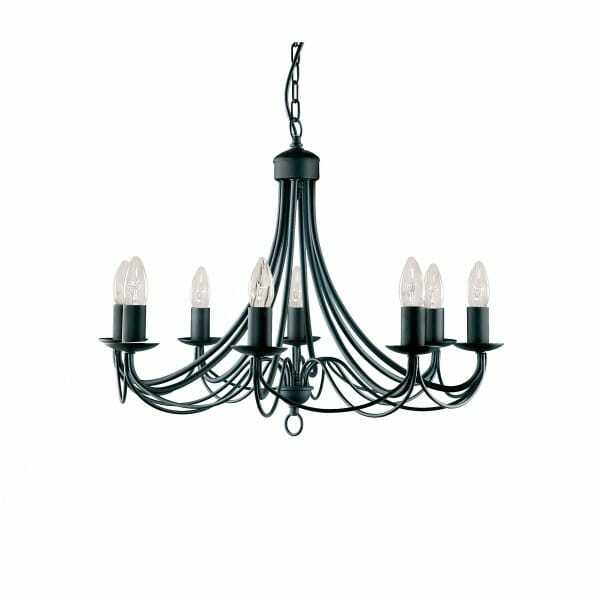 A simple silhouette with gentle, sweeping arms finished in black to offer the effect of wrought iron from the age. This period ran from approximately 1485 until the mid 1800’s and whilst naked flames were still used in the designs, we start to see an emergence of refinement in the styling of the lights along with the materials used. Silver, brass and glass were all used and the wealthy began to use elaborate lighting to showcase their success. Dark woods were also utilised in intricate shapes in their lights. These look great used in period homes with character and with some of the designs being smaller in stature that their predecessors, they would be ideal used in traditional and thatched cottages. 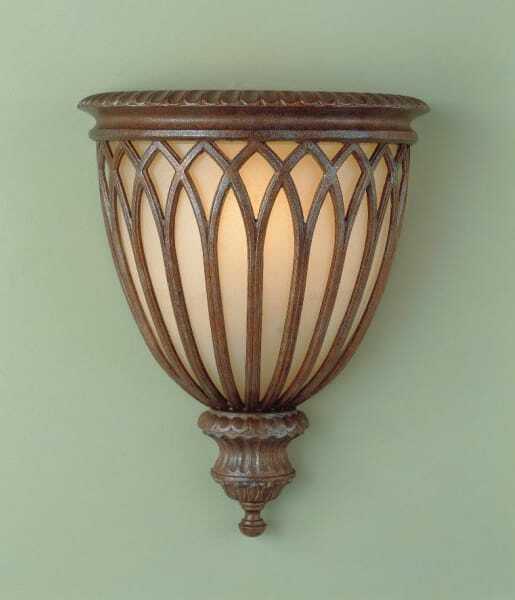 The Stirling Castle bronze rustic wall up-lighter is perfect in hallways, dining rooms and sitting rooms. Although still simple in shape and reminiscent of Medieval torches, the intricate metalwork hints at an amelioration of technique. Teamed with an excavation glass diffuser, this is great to add additional ambient light, especially for characterful cottages which may be lacking in ceiling height. The aptly named Tudor, by British Designers David Hunt, is an excellent example of typical lighting of the era. Finished in a rustic cream, which compliments the simple yet effect decoration. The ceiling light is dual mount, so can either be hung as a pendant light on the 50cm of chain available or used as a semi-flush light. During the reign of Victoria, technical advancements allowed for the most change in our lighting for centuries. Candles, oil lamps and coal were systematically swapped in favour of gas lamps which allowed for more ornate designs, they often featured exquisite glass work paired with highly polished metallics featuring scrolled embellishments. 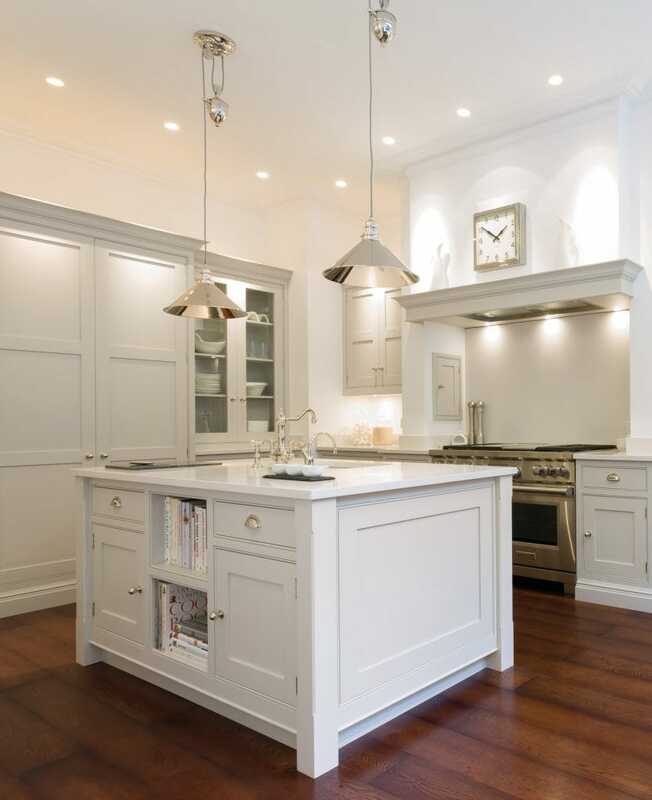 This style of lighting is perfect in Victorian and Edwardian homes and would also be ideal in slightly more modern properties where a period gravitas is sought. The Pinestar range are a shining example of classic hallway lantern lighting, teamed with the pineapple shape and decoration depicting the fascination with this opulent fruit throughout the era. The shade is a mouth blown etched glass which ensures that the illumination sparkles through the decoration for added luxury. Available in an aged brass, polished brass or polished chrome finish, the one below would be ideal in more modern homes to match in with the materials used. 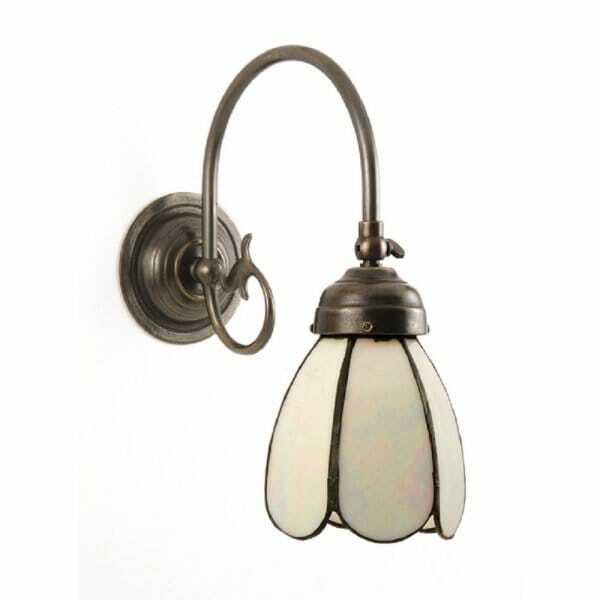 The Freda wall light is another great example. The metalwork is made in solid brass which has a natural tarnish which is then hand waxed to create the look of a restored antique. This is a reproduction based on popular lights of the Victorian and Edwardian eras, with the added functionality of an adjustable shade. Exterior lighting throughout this era gained a renewed momentum, with many wealthy home owners wanting to set the scene for the rest of the home. The Halleron range is based on a Victorian globe design and features wall lights and exterior pendants that are perfect for highlighting front doors, period porches and vestibules. The first Tiffany glass lamp was created by Louis Comfort Tiffany just before the turn of the 20th Century who originally designed stained glass windows. Using the scraps from the windows, he created decorative, handmade lamps that became extremely fashionable in subsequent years. Now they are sought after and are gaining a reputation as being antiques of the future. They fit perfectly into all period homes and many are in an Art Deco style which is enjoying a resurgence in modern homes. 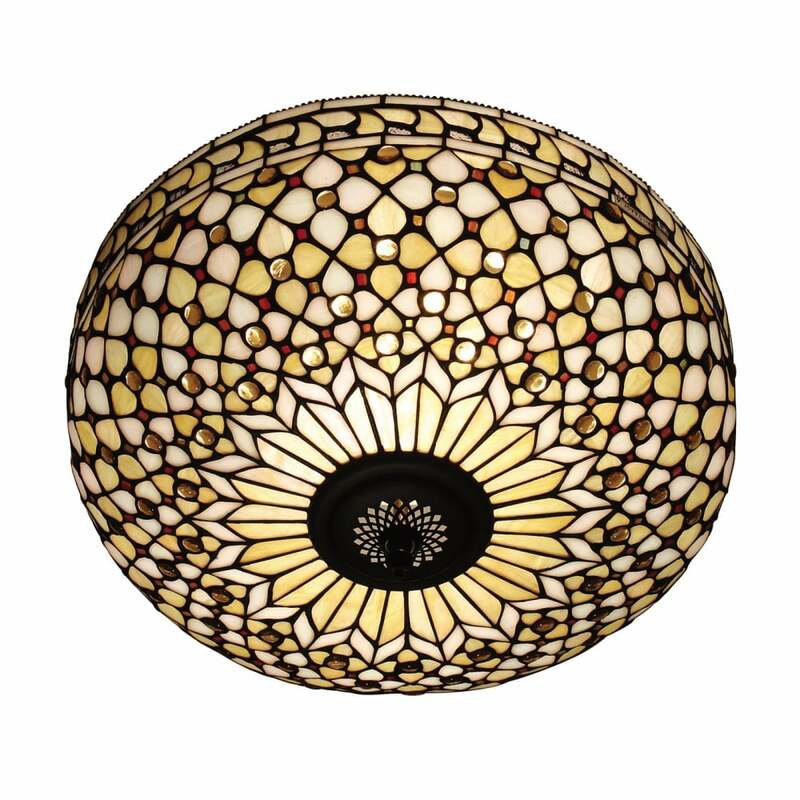 The Mille Feux range is an distinguished example of Tiffany glass lighting. French for ‘a thousand fires’, the intricate pieces of glass are painstakingly pieced together using the same, time honoured techniques that Tiffany himself adopted. The range features neutral tones of buttermilk and cream with amber beads which ensure a seamless fit with any colour interior. 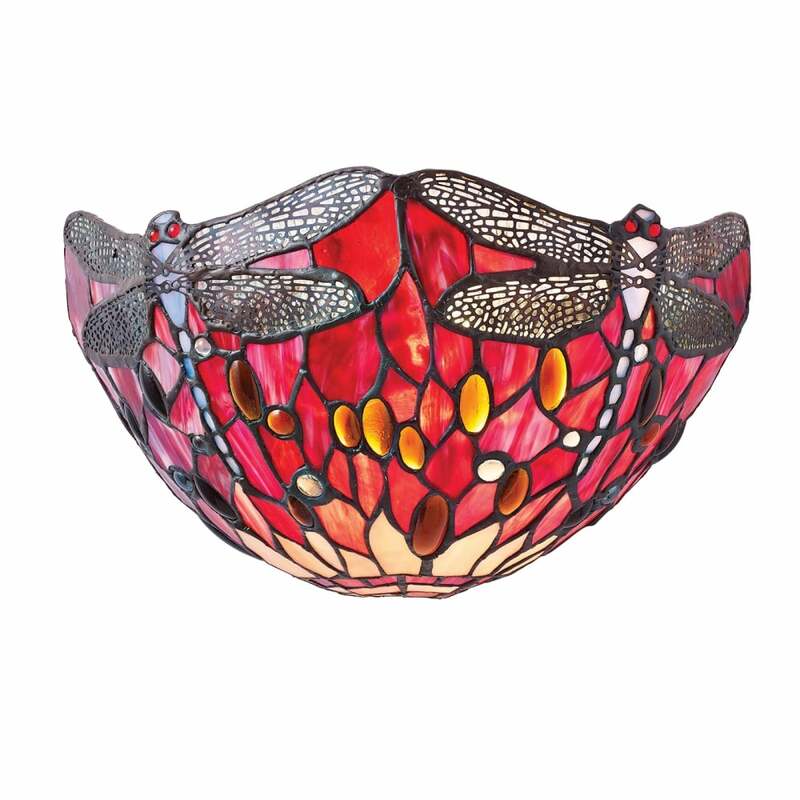 The Red Dragonfly pattern is commonly associated with Tiffany lighting and offers a bright injection of colour which was popular in period homes of the times. Many fabrics were still dyed using natural materials at the time which was hugely labour intensive, so it became a popular way of brightening up the home. These terms are often confused; Art Nouveau was a short lived style that spanned around 30 years from around 1890 and featured intricate floral motifs amongst which were the popular ‘Rose’ by Charles Rennie Mackintosh. Feminine forms were regularly used in the designs along with botanical influences in both design and colour. These are great used in any period home and add a distinctive formality that’s indicative of the style. 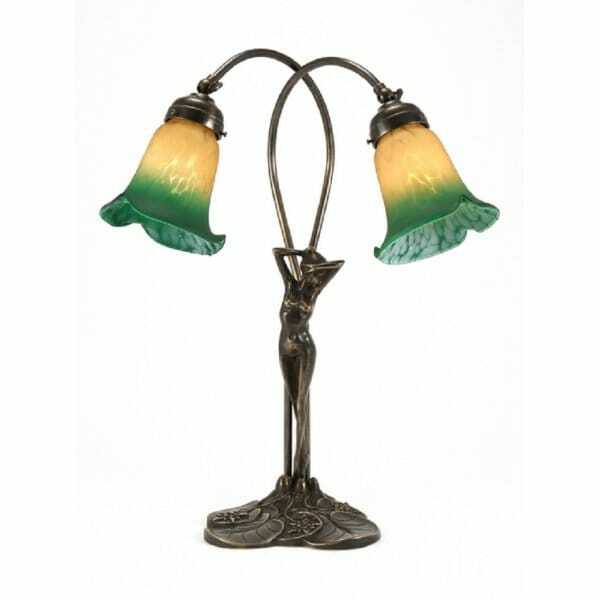 The Elizabetta table lamp is an admiral illustration of Art Nouveau style. Using the female form as the base, the shades are reminiscent of flower petals in a soft buttermilk and green fluted glass shade. 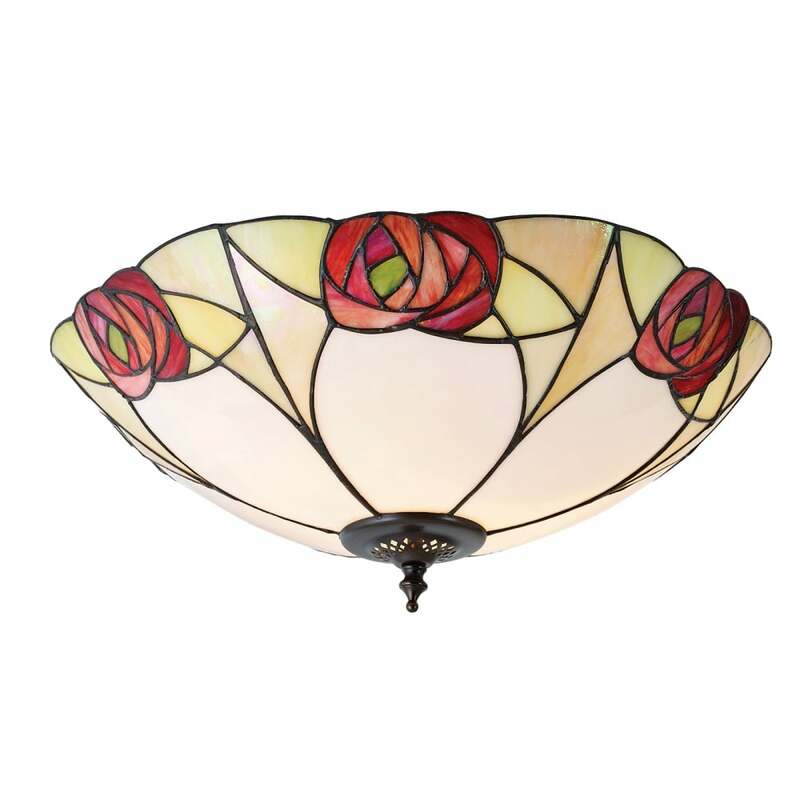 The Ingram flush ceiling light features the iconic Mackintosh pink styalised rose. Perfect for homes with standard or low ceilings, the creams, greens and pinks really offer a beautiful addition to a more subtle Art Nouveau room. The popularity of the Art Nouveau was superseded by the Art Deco styling which although began at the beginning of the 1900’s, it really rose to it’s peak in between the two World Wars, reflecting the golden era and modernity of the moment. Bold, symmetrical with a focus on quality, this was a glamorous look that is still relevant today. 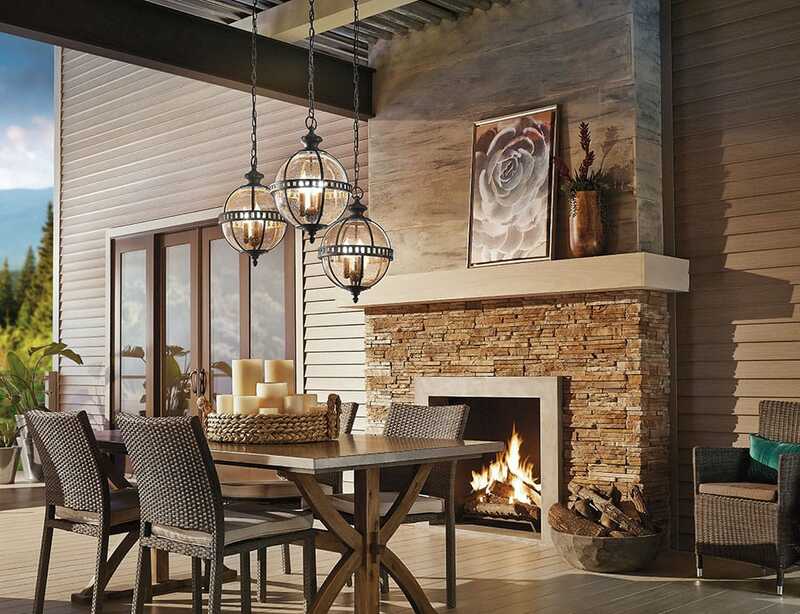 The Meridian range features the 3 light ceiling pendant below along with a 3 light semi-flush ceiling light, a three and five light ceiling pendant and a wall light, so you’re sure to get a cohesive look in your Art Deco room. The elegant curves of the metalwork contrast with the clean lines of the shade. Effortlessly simple, this was a bold, contemporary look of the era, far removed from the intricacies of the more recent eras. The shade features a faceted glass diffuser for glare free illumination and is therefore ideal over kitchen islands, breakfast bars and dining tables in modern and Art Deco homes. The Moxie range of Art Deco inspired lights adds a more grounded representation of popular lighting, again with the modern clean lines, but teamed here with more familiar bronze metalwork and a cream shade. 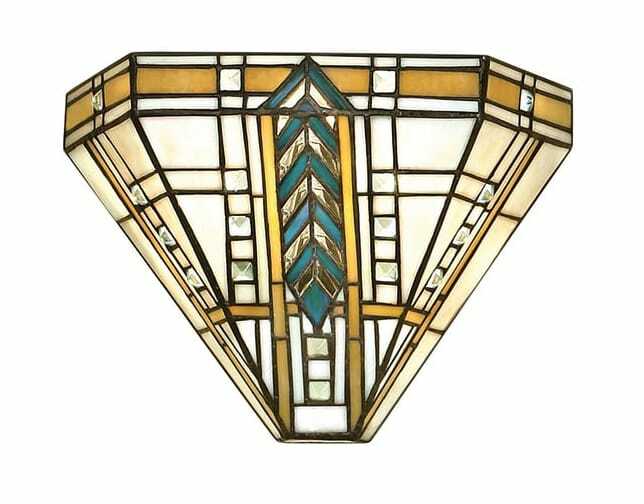 Tiffany lighting is prolific in Art Deco designs, with the design favouring geometric shapes rather than botanicals. Bold lines and sophisticated colours ensured that the beauty of the Tiffany glass lighting designs continued to flourish. The Lloyd range of Art Deco Tiffany glass lights showcases a design inspired by American architect Frank Lloyd Wright who was, and remains to be thought of as the pioneer of design for the era. Echoing the intricacy and beauty of the Art Nouveau era but with the more modern shape and structure that was sought after. Taking inspiration from iconic lighting designs through from the turn of the 20th Century to the swinging 60’s, there is a charm and sentimentality amongst the early designs, with the later designs offering a sense of fun and vibrancy. It’s a look that works in any setting, whether you want to add some vintage charm to a modern home, add some authenticity to a mid-century home or add a modern twist to period homes, it strikes a balance between contemporary and traditional that makes bridging the gap of eras easy. 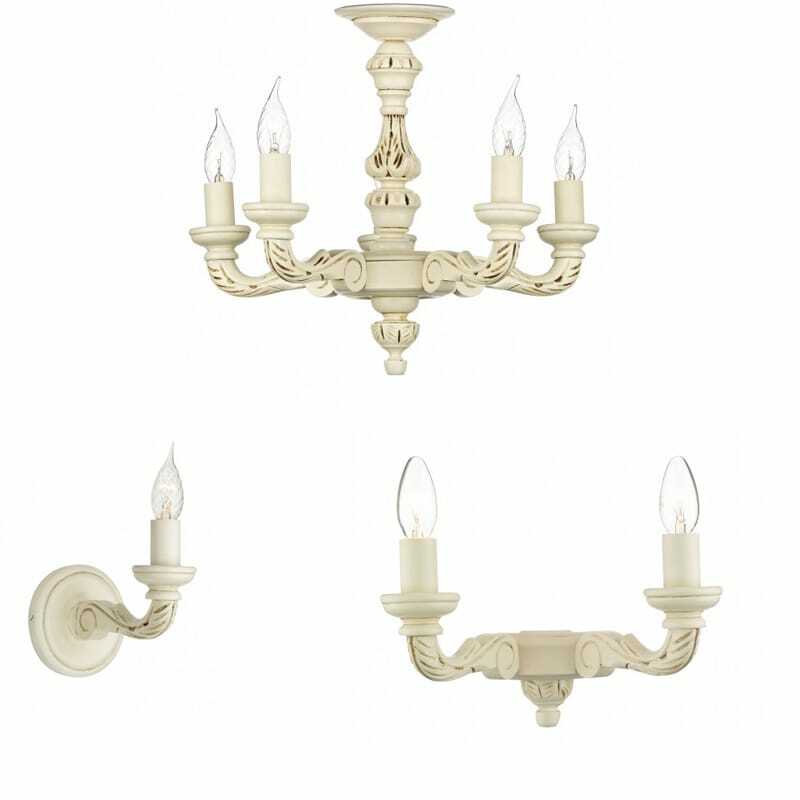 The Provence range takes it’s inspiration from French lighting designs that were popular in the mid 1900’s. 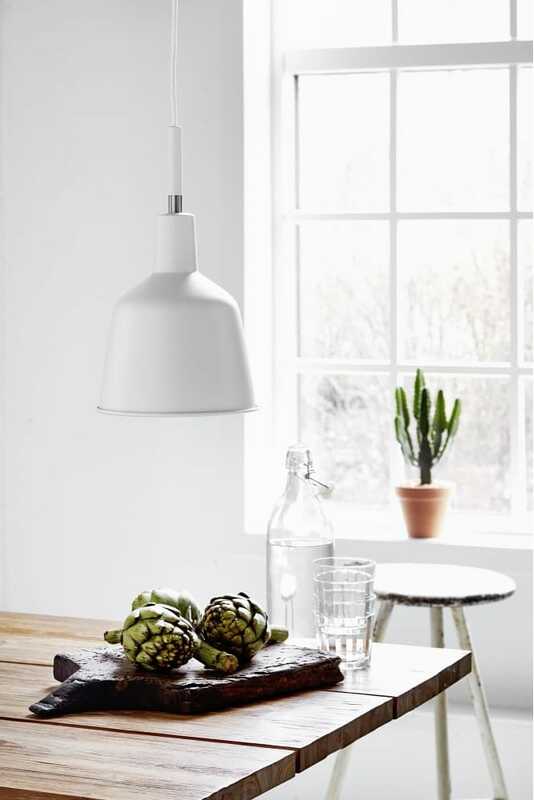 Available in rise and fall (as pictured) which allows you to adjust the height of the light with ease, table lamps and wall pendants which can be used as an adjustable wall light or a ceiling pendant – you’re sure to find the perfect lighting solution for any area of the home. In addition to the polished nickel shown above, they are also available in old bronze, copper and brass to match in with metals used throughout the rest of your room. The Colour range features a mix-and-match style range of shades in pink, yellow and blue. 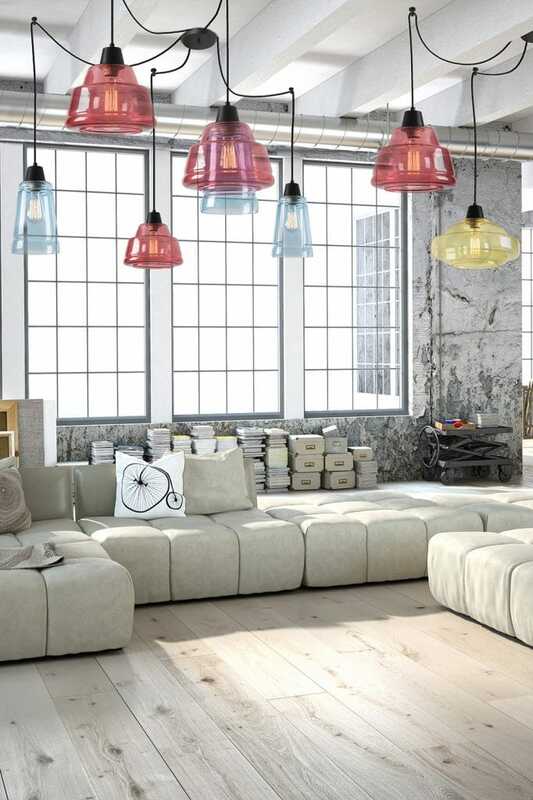 Instantly adding a pop of colour and design feature, the glass shades are reminiscent of old fashioned sweet jars and add an effortless sense of fun to any room. A style that sums up an ‘English Rose’, effortlessly beautiful lighting that adds character and allure to traditional settings. 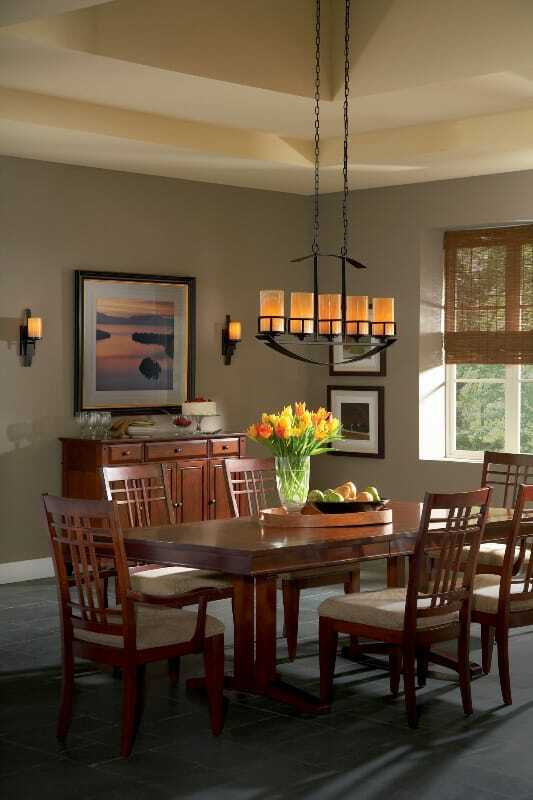 It may be an elegant chandelier, or a ceramic table lamp – the key is in the timeless appeal and decadent excellence. This style is great to add a quality flourish to traditional and period settings as they will echo key design styles with a subtle twist of modernity that sees them fit in most settings with ease. 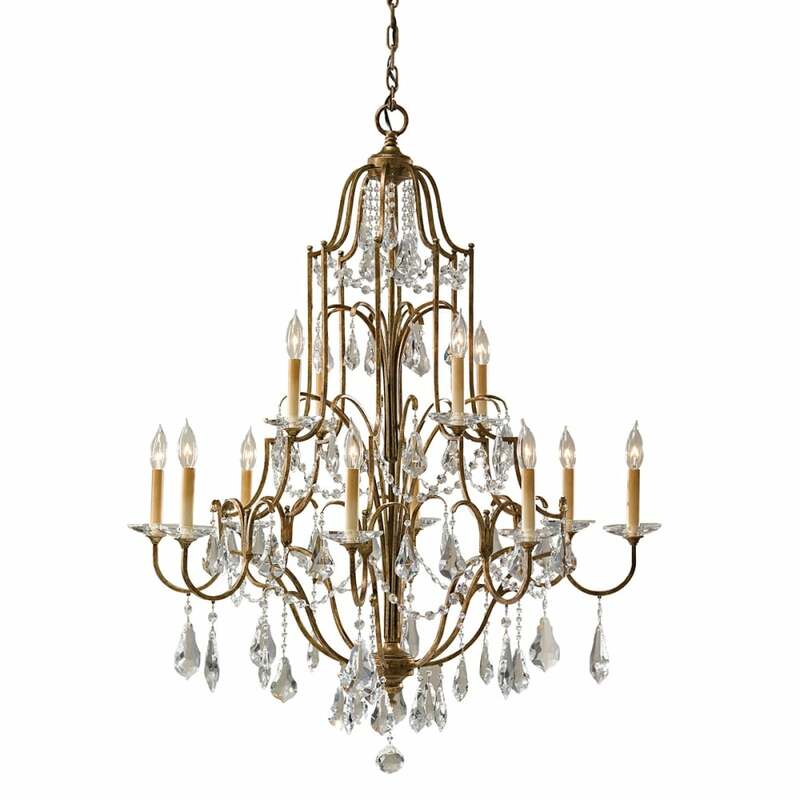 The Valentina 12 light tiered chandelier in a bronze finish features a plethora of ornate detailing. The arms are elegant and slim with glass bead detailing draping around, like a row of twinkling diamonds. The quality has to be seen to be believed – the crystal drops that cascade beneath are violin shaped exquisitely cut glass which catch the light for a luxurious sparkle. 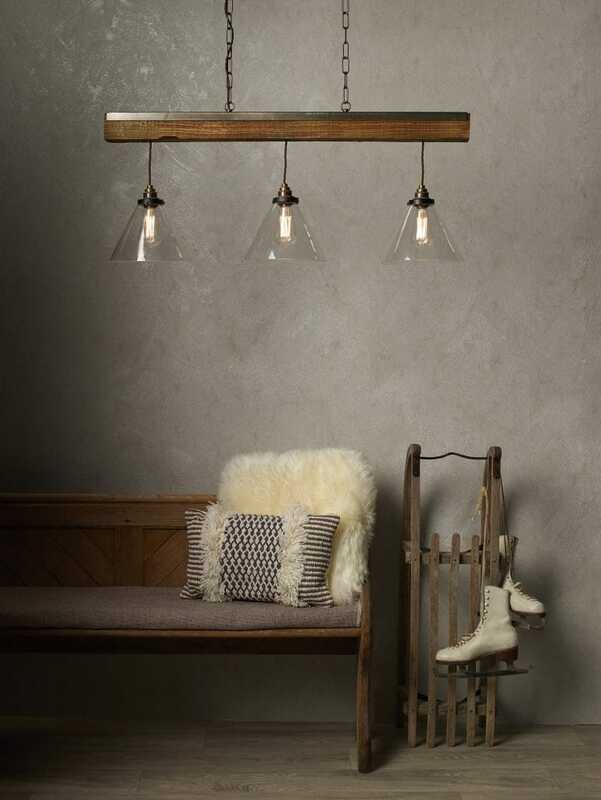 The Aspen 3 light ceiling pendant bar takes it’s lead from vintage styling with a rustic twist. The tapered shades in clear glass contrast with the thick wooden beam suspension which sees this add a chic look to any traditional setting. 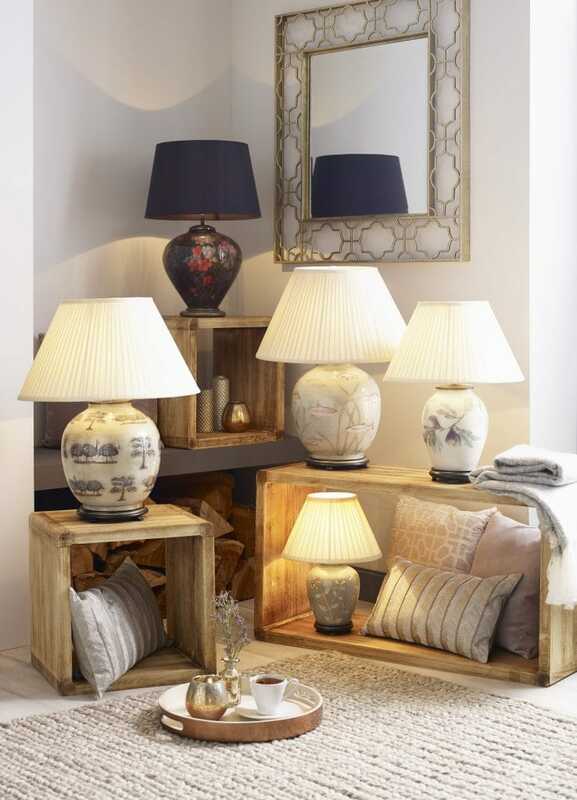 Jenny Worrall table lamps are renowned for their superlative quality and attention to detail. Handmade in small batches, they feature mouthblown glass with hand painted designs of botanicals, nature and wildlife to ensure that each lamp is unique and a work of art. The sheen of the glass makes the lamps come alive when illuminated or in natural daylight and the colours and pictures used will rival those of a masterpiece. These are widely considered to be antiques of the future and would make an excellent addition to traditional living rooms. A style that takes the best of traditional designs and convenience and adds a modern finish, colour or edge to see them fit into more modern homes with ease. 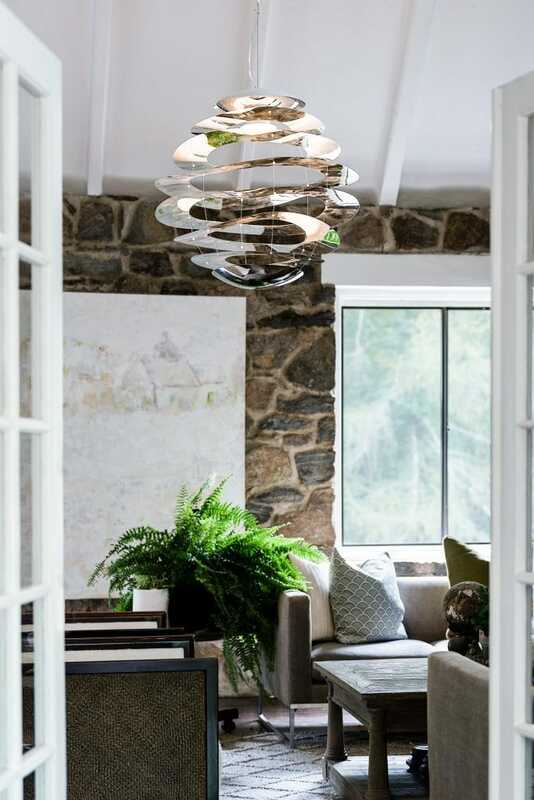 There’s no doubting that the Patton ceiling pendant in white is a modern statement, however you will notice the influence of the workshop lamps of the 1920’s. The result is a timeless style that is as relevant today as it will be in decades time, when it will move seamlessly to a retro influence of the future. The Homefield ceiling pendant takes the traditional glass box lantern design and gives it a modern look with a sharp silhouette and acute detailing teamed with the clear glass panels. 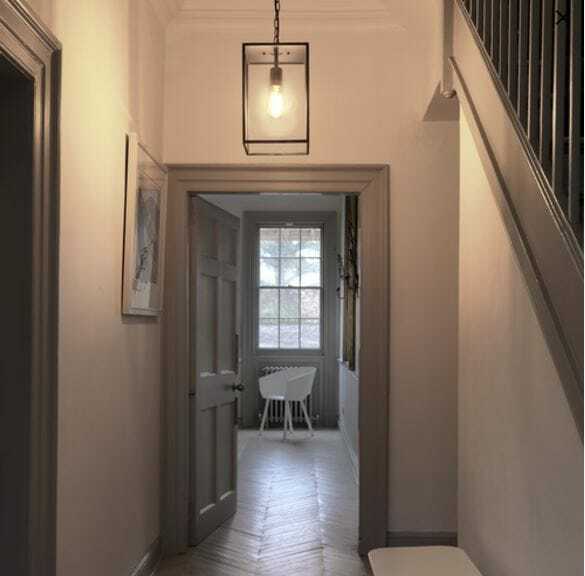 The look can be changed as easily as changing your light bulb which is on show – add a traditional looking LED filament bulb for a more traditional feel, or perhaps a smart bulb for a more contemporary and fun look. 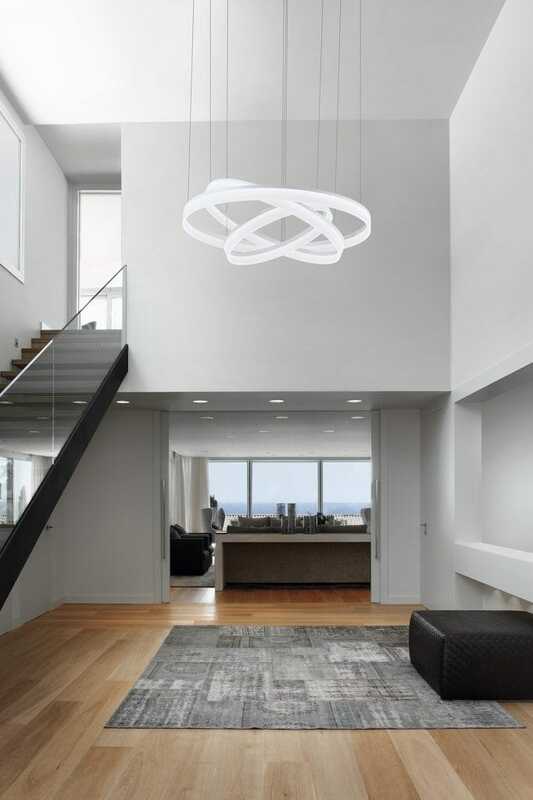 Challenging convention, these lights will add an interest to modern homes and create an interest to your lighting design. Many will also feature the latest technology, allowing you keep up to date with the times. Truly eye-catching, the ‘Circ’ features three rings that can be positioned flat or twisted to give the look shown above. At a metre in diameter, this is a show stopping light that will add a real impact to contemporary homes. The LEDs allow for the modernity of the design and offer 8544 lumens (equivalent of 8 and a half old-fashioned 100 watt bulbs!) from the running cost of just 89 watts. The Buckle is a contemporary statement, playing on the fluidity of its form. Curved stainless steel rings are polished to a mirror shine and appear to ‘float’ from the suspension. It comes with a 7 metre cable, so is ideal for those with high ceilings, or in double height rooms. 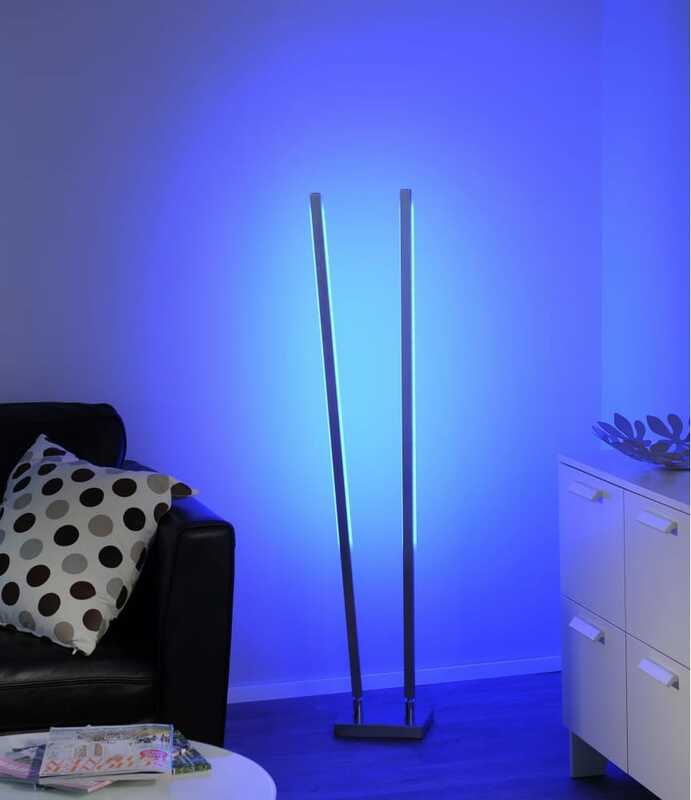 A modern and sleek design dual light floor lamp in a steel finish, the Qglido floor lamp features two LED strips with RGB colour change functionality. It comes complete with the remote control, allowing for quick operation including dimmable options. We’re here to help you, so if you are looking for something in particular or just need a little advice; we are experts in lighting so, contact us and we’ll be happy to help! Next → Next post: The Definitive Guide to Chandeliers. 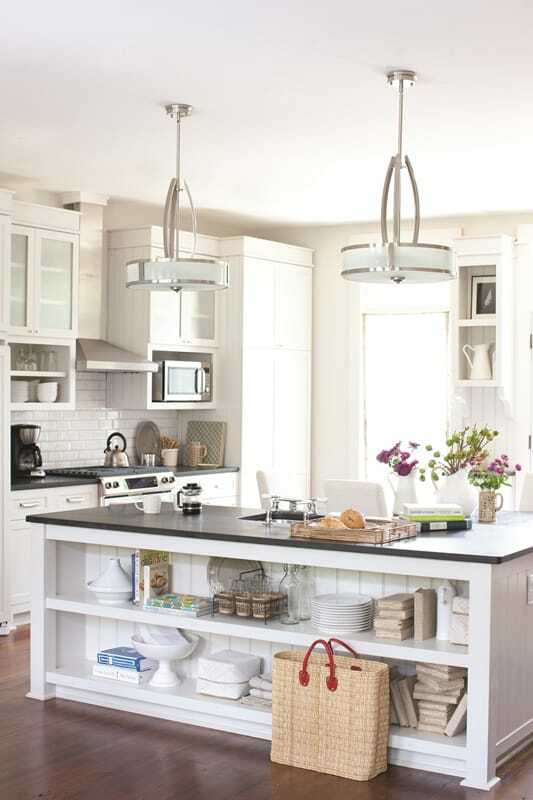 Choosing, Buying and Caring for your Chandelier.